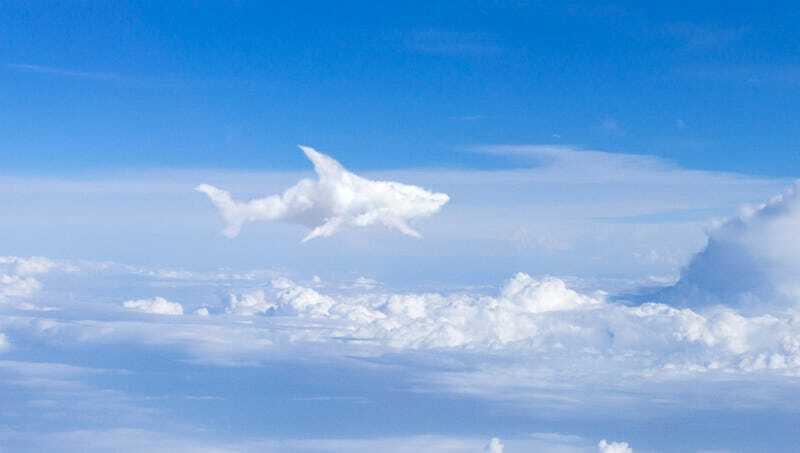 TEMPE, AZ—Advising passengers on Flight 523 to Chicago to sit tight while the aircraft was rerouted, United Airlines pilot Thomas Langard informed his passengers Friday that they would be altering course to avoid a scary cloud that looked just like a big shark. “This is your captain speaking; it’s my duty to inform you that we will be departing slightly from our charted route in order to avoid a terrifying cumulonimbus cloud that resembles a really big great white shark,” said Langard over the intercom, apologizing for the 20-30 minutes the detour would add to their flight time but emphasizing that there was no other way to avoid the giant sky shark. “Ladies and gentlemen, I am scared—although meteorology out of Phoenix Tower tells me it’s just a cloud, my professional experience tells me it looks exactly like a big, angry shark with sharp teeth, so on behalf of your flight crew I’m going to go ahead and veer eastward so we can keep our distance. People on the left side of the aircraft may want to lower their window shades to avoid getting spooked by the cloud shark or even looking it in the eyes and getting it angry, and we’ll be sending our flight attendants to distribute blankets in case you want something to hide under.” Federal air traffic control later reported that Langard returned the plane to its original course after prevailing high-altitude winds transformed the cloud into a playful and friendly dolphin.